I noticed after Josh broke this new, the reaction of fans were about as up and down as a roller coaster. Some hope he will gone and are quick to mention his flaws from years past. Some think the Penguins management has absolutely no idea what they are doing and are calling for a firing before the season even begins. I am kind of in between. MAFFan: This can't be happening! MAFFan: It's just one game. MAFHater: What a joke! Trade him now! MAFFan: See? We can't let him go. He's elite! MAFHater: He can't do that in April! MAFFan: He did last April!!!! This “argument” can go on for months. It will likely get both individuals losing because generally goalies have good games and then goalies have bad games. It has almost become a type of unrealistic expectation thrust upon Pittsburgh’s athletes. Some fans expect perfection every time. I recently read an article arguing that Fleury is holding the Penguins back from another Stanley Cup, as if one player could ever hold back a whole team from a Stanley Cup. Newsflash: last I checked Fleury was not the Penguins biggest issue last season. I would more so cite the fact that I can name the players that showed up on one hand. Might I also mention that Fleury was one of those players. Please look at the 2008-2009 season versus the 2013-2014. Yeah. I noticed that too. Jay-Z said it best "men lie, women lie, numbers don't" To claim Marc-Andre Fleury did not come back this season from past issues is factually incorrect. Then to compare it to the season we won the Cup is just inaccurate and gives everyone a little laugh. I understand the frustration in years past but if you want to fight over Fleury ruining the playoffs this year or not deserving an extension please analyze the stats before you fight. After that please let me know who would be available and do a better job. Remember kids- sometimes we want a change until the change actually comes. After that we are left wishing things could go back to the way they were. I will never understand why people bend over backwards to compliment what amounts to league average. Sure, he came back and his numbers were better than in 2008-09. What about the 5 year sample size in between? The only thing I take from the 2008-09 season is that the team was excellent and clearly won in spite of Fleury's numbers. I guess I just think the standard should be higher. 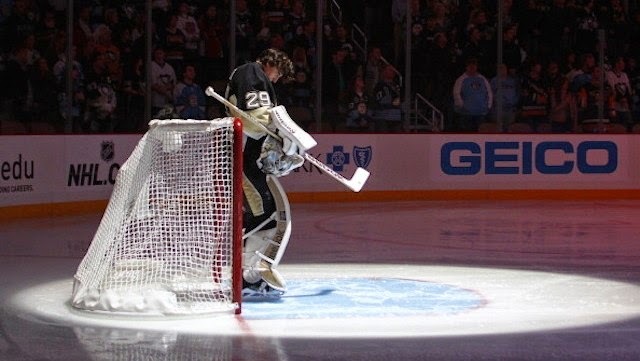 Fleury didn't go above .900% in five of the seven games against the Rangers (the other two were shutouts). Given the possession advantage the Penguins had in that series you need a goalie who can consistently go above .900%. And if we are all being honest .900% shouldn't be the benchmark. The NHL in the Cup Year ... hockey was played differently ... rules have changed ... stats will lie ... wins don't!